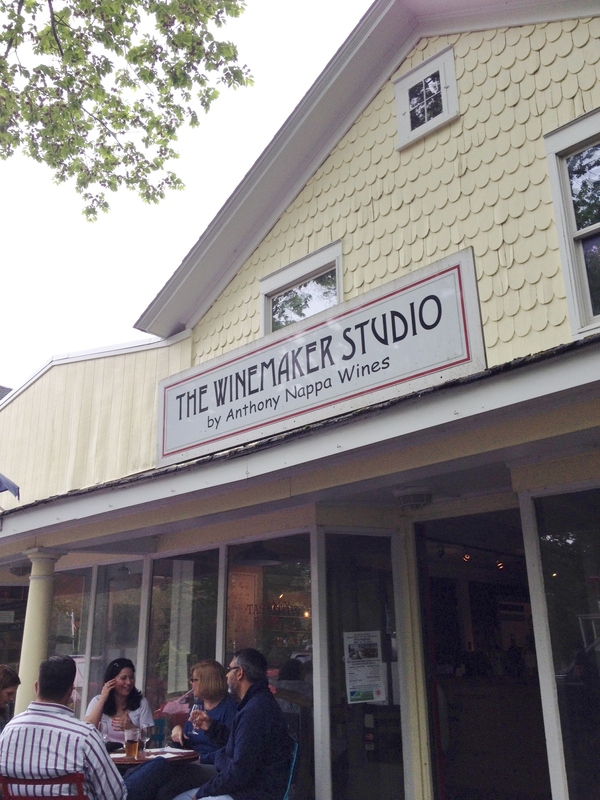 Proving once again that regular visits to all wineries are essential, we noted several changes at Anthony Nappa’s Winemaker Studio since our last visit there in July. For example, the emphasis has gone from looking at the wines of many winemakers to a focus on Nappa’s own wines, although others are available, including for purchase. Today, the choice is between a set menu of five wines for $10 by Russell Hearn, under his SuHru and T’Jara labels, or any of fourteen wines by Nappa at $2 per taste. After some serious discussion, we decide to share two tastings, one of the Hearn wines and the other of five wines from Nappa’s list. 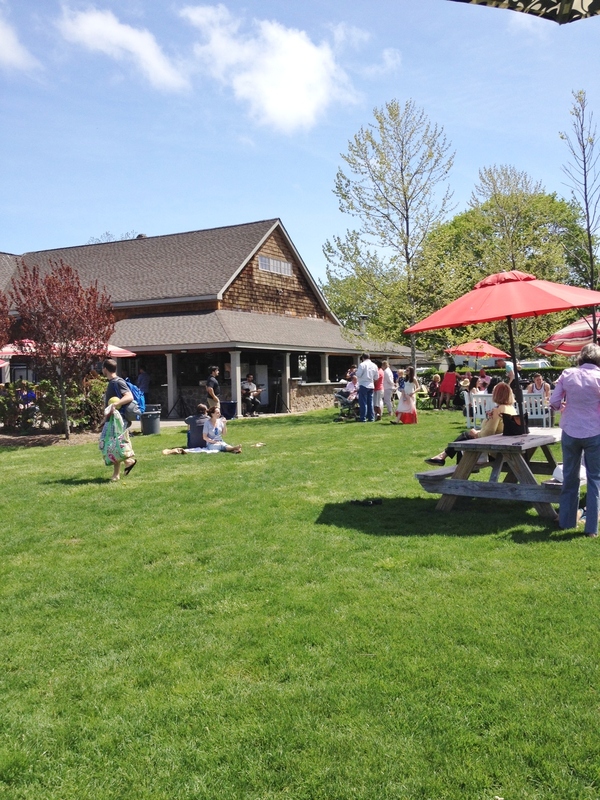 We also could have had a beer from Greenport Brewing Company or hard cider or espresso. Note the Greenport Harbor Brewing Company tap. 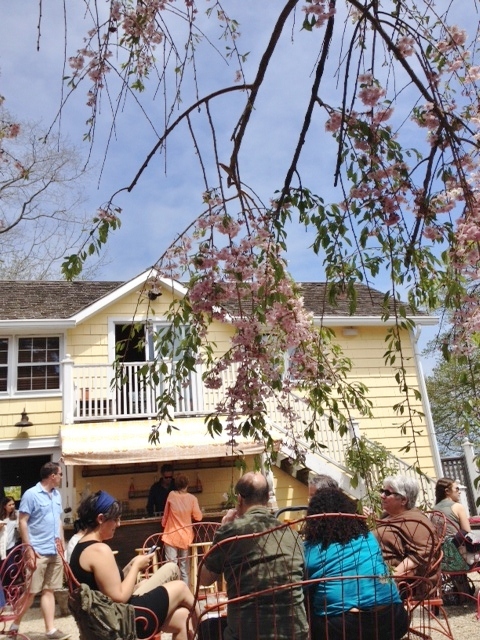 The building is over 100 years old, which contributes to the cozy feeling of the place, and is divided into two halves, with one half the tasting room with a bar and some little tables and chairs, and the other half a store called Provisions, which offers both a selection of groceries and a menu of sandwiches and snacks. While we were there we saw one party enjoying some paninis—which smelled delicious—with their wine. 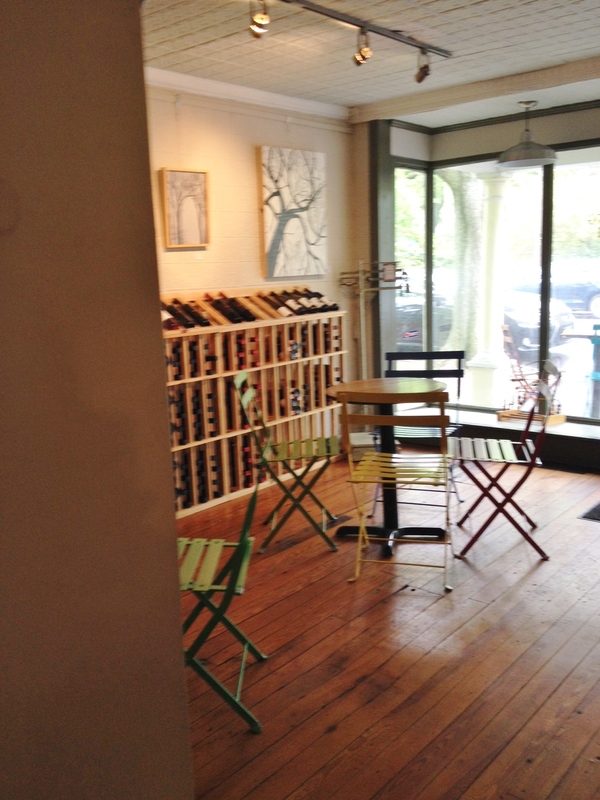 We could also have bought wines by the bottle from Leo Family, Race Wines, Coffee Pot Cellars (which now has their own place), and Influence Wines. 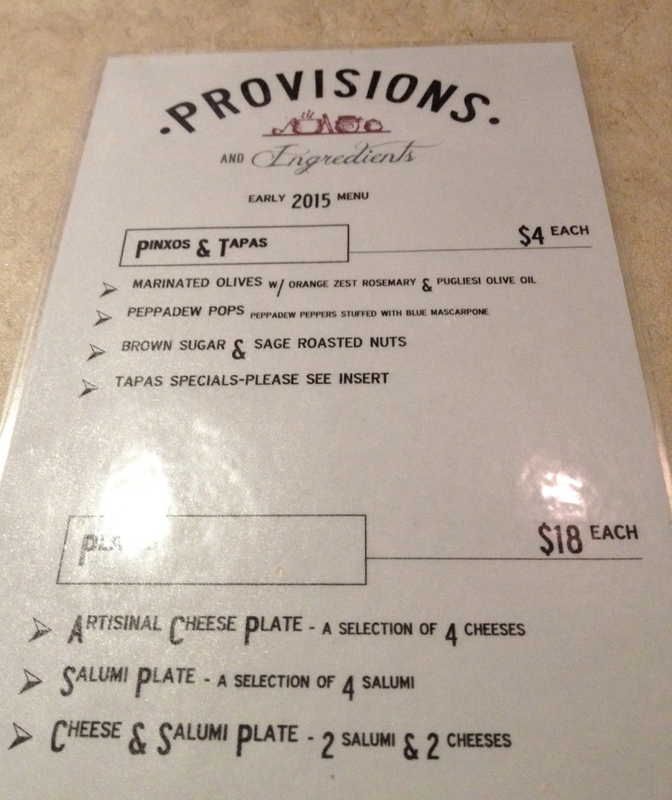 You can see Provisions through the window. Our server, by the way, was quite pleasant and very knowledgeable, and we overheard her giving a pair of North Fork novices some good advice as to which wineries they would and would not like. 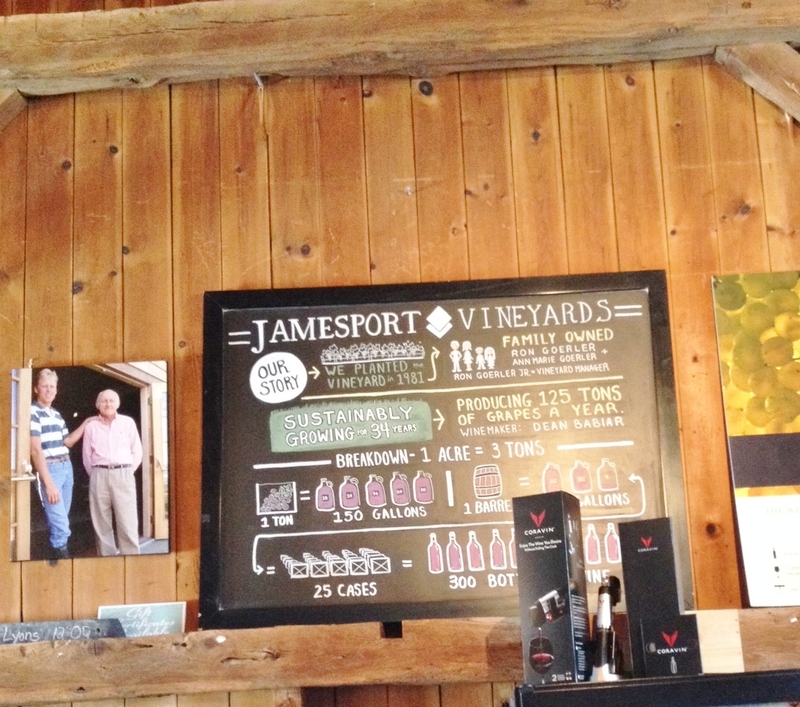 Based on their preferences, we suggested their next stop should be One Woman Winery. I’ll list the wines as we drank them, with the Anthony Nappa wines second. Nice way to start a tasting. This is a bright, citrusy white with a slightly funky, mineral aroma. Though somewhat too dry to be a sipper, it would go great with oysters. As you may have guessed from the name, this is a sparkling wine, made in the Méthode Champenoise from pinot noir, riesling, and gewürztraminer. Because it is unfiltered, it is somewhat cloudy. Given the grapes it is made from, I thought it might be sweet, but, though it has a touch of sweetness, it is dry, with aromas of pear and orange flower. Our server compares it to a Prosecco, and says she likes it with sushi. I think it would be great with some charcuterie! And given the price, one could drink this without waiting for an occasion. As I’m sniffing and thinking, hmmm…toast, lemon peel, minerals, my husband says, “This is very like a Kim Crawford Sauvignon Blanc, and so anyone who liked that would like this.” I’ll have to do some research to verify that, but meanwhile I taste lemon and gooseberries. 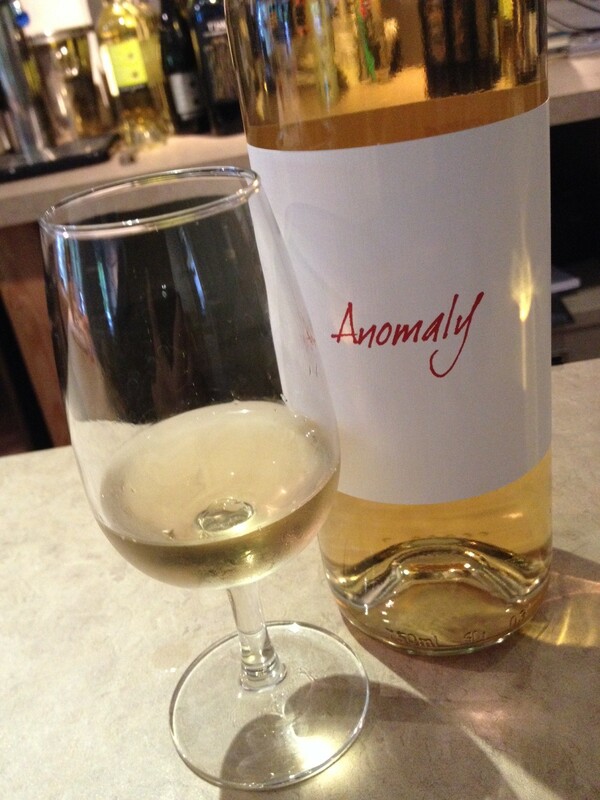 The Anomaly is Nappa’s signature wine, a white made from red pinot noir grapes, and it is quite nice, though we liked it better the first time we had it. The aroma is a tad funky, with some minerality and a smell like raw yeast dough. It is fairly crisp, and we taste sour cherries. New glasses for the reds. 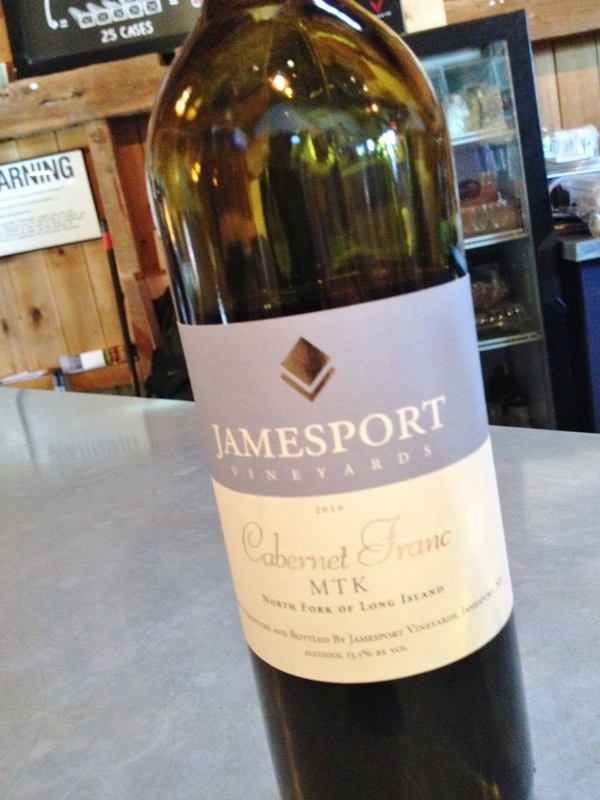 Aged in oak, this has aromas of asparagus, coffee beans, and cherry juice, with tastes of spice and dark fruit. 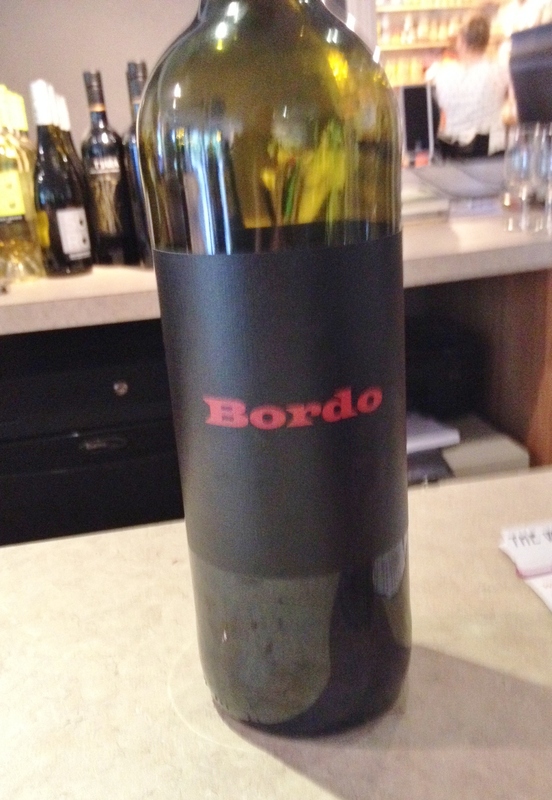 It’s quite good, and we like the finish, and think it would pair well with veal Milanese. Since Russell Hearn used to be the winemaker for Pellegrini, and we like their reds, it’s logical that we would like the reds he makes under his own label. I kind of expected this to be a Bordeaux, based on the name, but it is made from steel-fermented cabernet franc. Our server describes it as a “rustic Italian” wine, and says, among other flavors, that it has tastes of calamata olives. We agree, and also think we taste dark plums and raisins, plus maybe some black cherry. Although there’s lots of fruit tastes, it is relatively simple, in that there aren’t layers of flavor. In any event, it would go great with pizza or pasta! We really liked the clean, simple, modern style of Nappa’s labels. 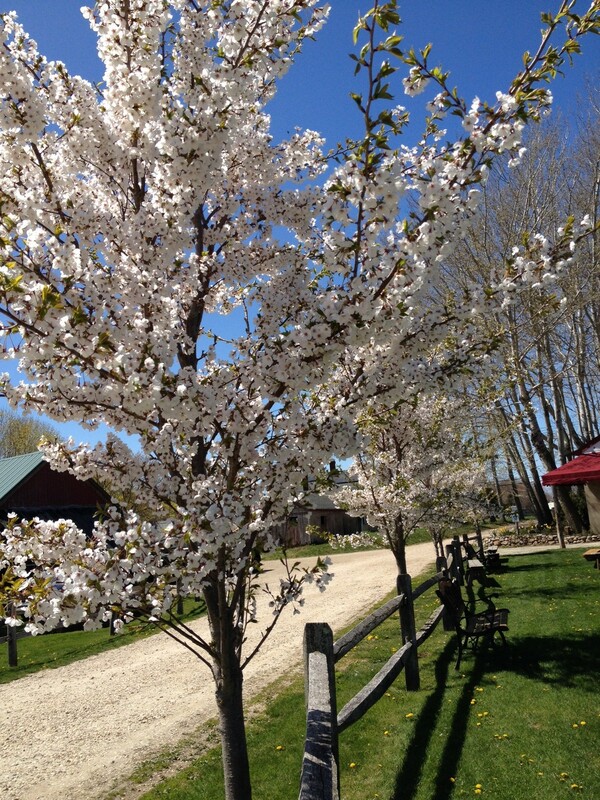 Just as my husband noted that the barnyard odors we used to sense frequently in North Fork wines are mostly gone, and I reminded him that it was merlots that featured it, we sniff this and find just a touch of barnyard. 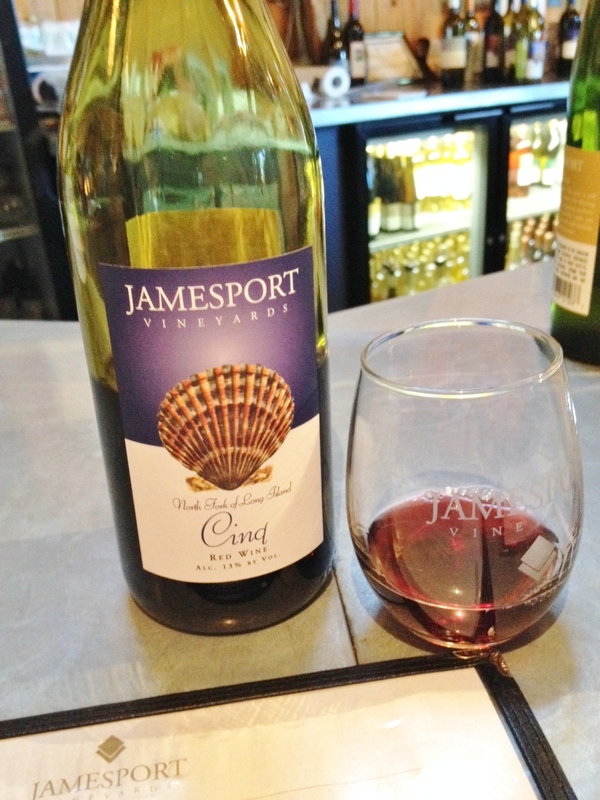 Otherwise, lots of berry aromas and sour plum tastes in this somewhat tannic red. Not at all soft, it would go well with pasta with a rich meat sauce. Named for the vintage year, this is a blend of 67% merlot, 28% cabernet franc, and 5% cabernet sauvignon, aged in French oak for 18 months. A Right Bank Bordeaux, says my drinking pal. Aroma: Captain Black tobacco, chocolate, red fruits. Taste: cherry, dry yet soft, with some tannins. Compared with how it tasted a year ago, we decide it has aged well so far, though it could be overwhelmed by a big steak dinner. I love doing side by side comparisons. Also aged in French oak, this is, despite the name, a bit of a blend: 89% merlot, 5% cabernet franc, 2% malbec, 2% cabernet sauvignon. “Unripe peach pit,” opines my pal, as he sniffs. Really? Okay, maybe. Also currants, perhaps. We taste and agree on dried fruits and unsweetened cocoa. 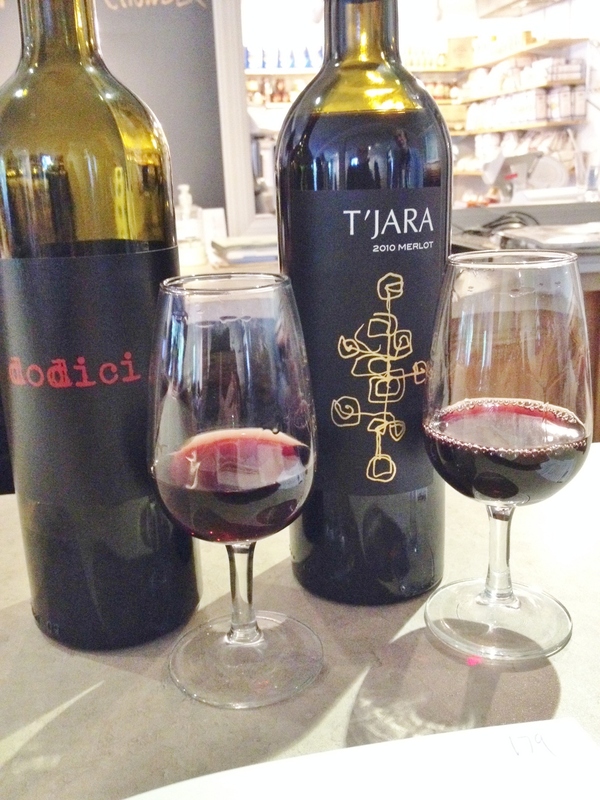 In a head to head with dodici, we choose the T’Jara. Why Blackbird? 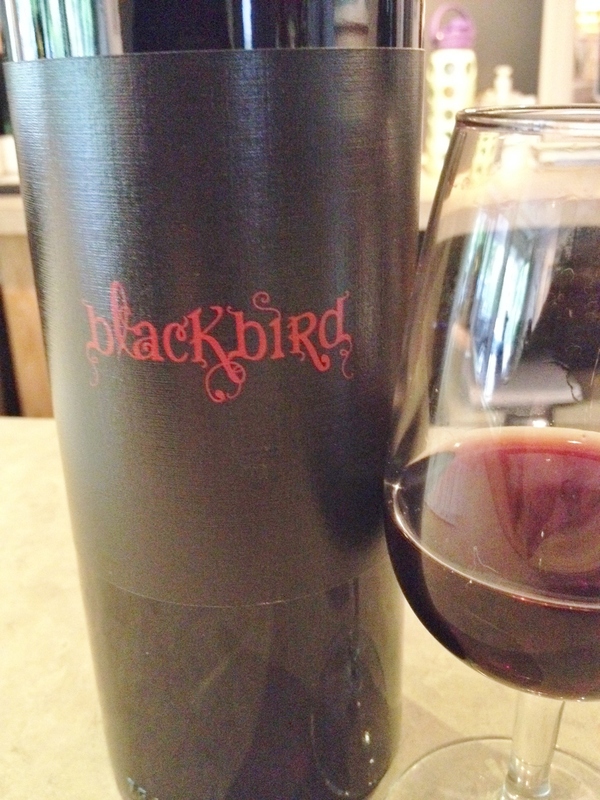 Because merlot is the French word for blackbird, says the server. Well, close, it is “merle,” and this is Nappa’s Reserve Merlot. Red cherry taste, quite tannic, not much aroma: we think it would be better with food, but are not thrilled with this wine. Not bad, mind you, but not worth the price. One corner of the room. The furniture is cute, but could be more comfy. Reasons to visit: the chance to taste and buy wines from more than one winemaker; some offbeat choices like the Frizzante and the Anomaly; the lovely food from Provisions; a relaxed atmosphere; the Suhru Sauvignon Blanc, the Bordo, the T’Jara Reserve Merlot, the Dodici; freshly made espresso or cappuccino for those who have had enough wine. 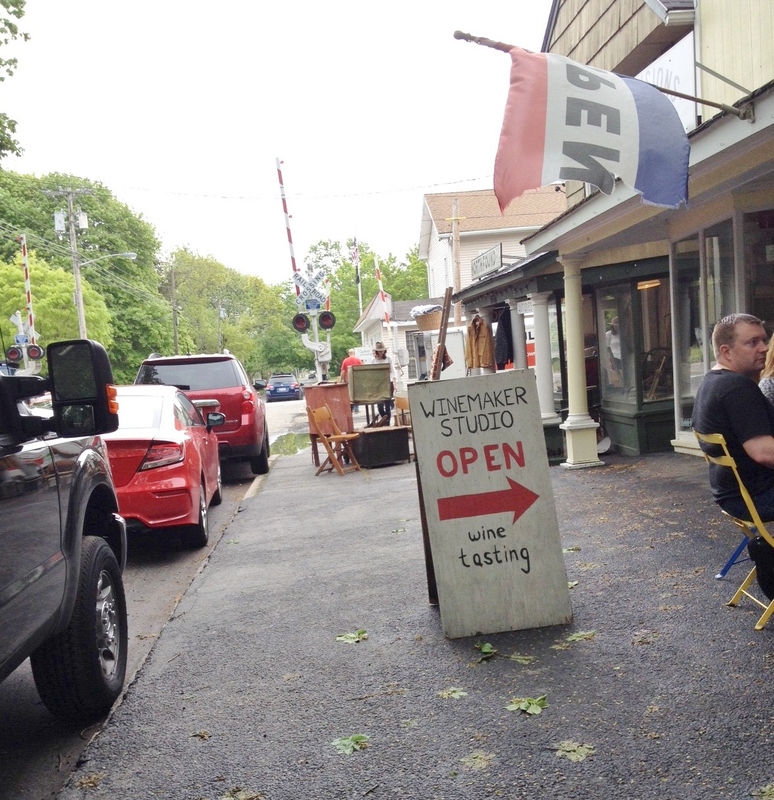 We did both—a tasting inside at the bar, then a glass each to sip as we relaxed outside. Since our son was with us, we decided to share two tastings, which are $15 for five tastes, chosen from their menu of wines. 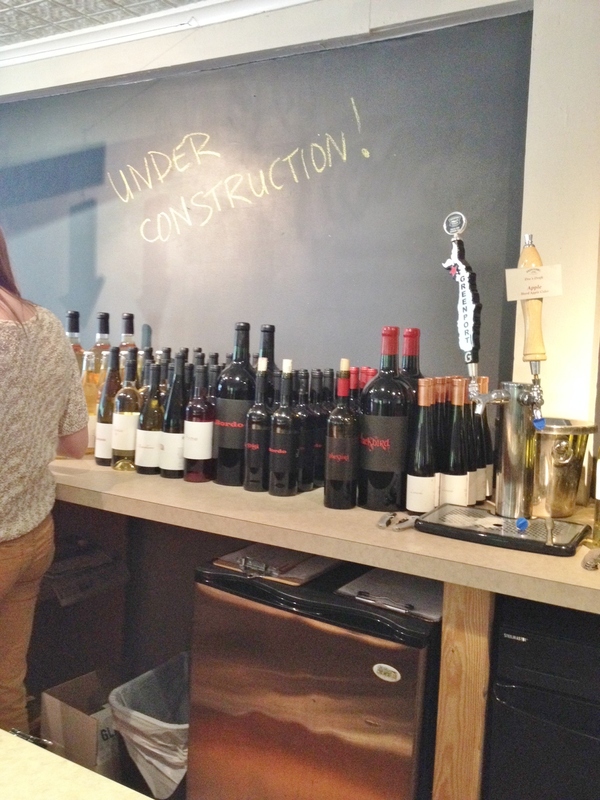 We coordinated our choices, so you’ll get to read about ten of their wines. 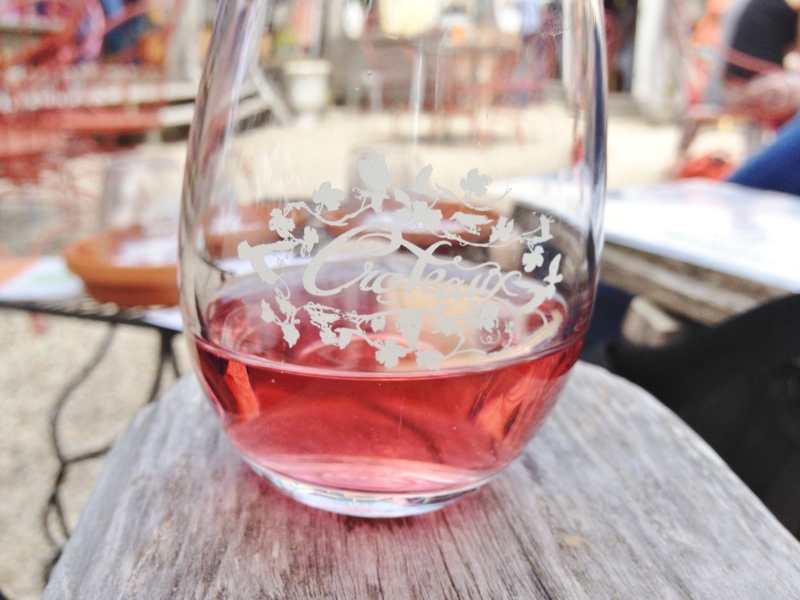 There were a few we didn’t get to sample, such as their rosé, which, after being at Croteaux the day before, we decided not to try. 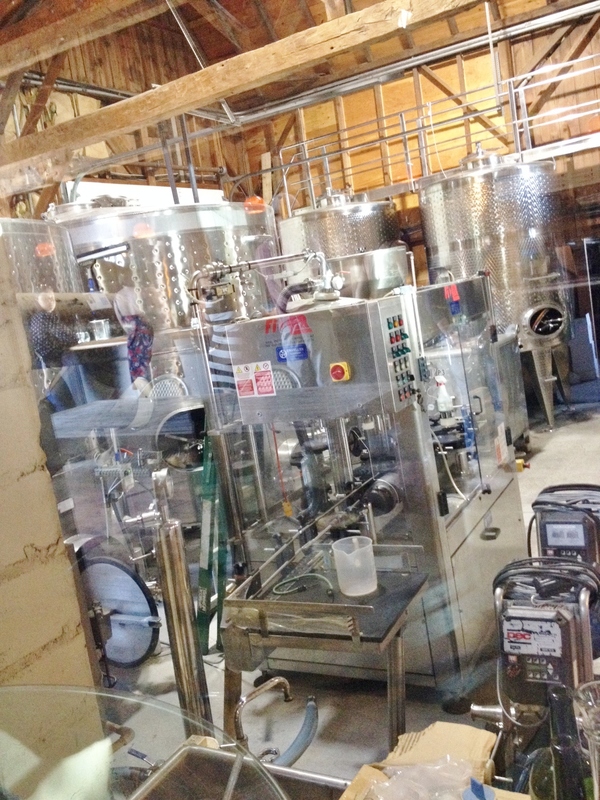 You can peek at some of the wine-making equipment from the tasting room. 90% steel fermented, 10% oak, means that this is a somewhat crisp chardonnay, though it is a tad sweet for us. The aroma is of citrus and roasted pear. 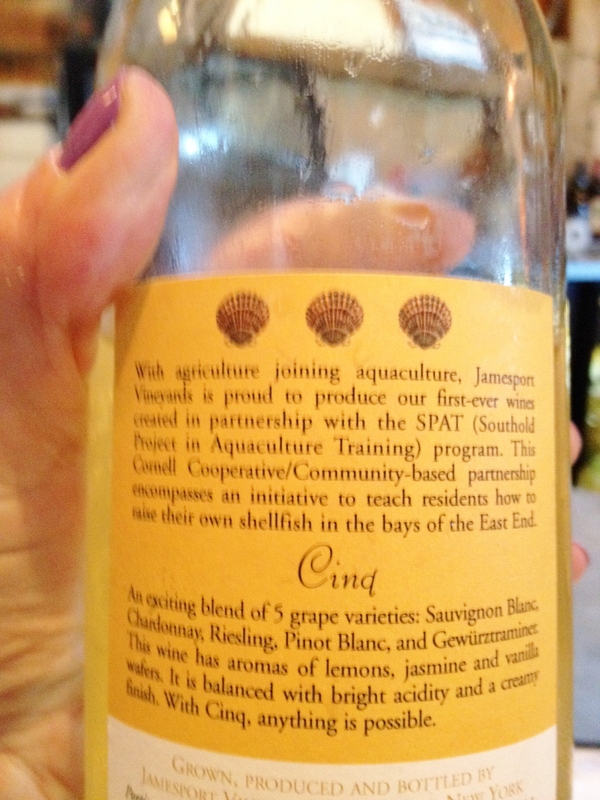 If you order certain wines, you support aquaculture on the East End. Nice. Flowery honeysuckle aroma and a nice mouth feel with a fair amount of fruit, especially barely ripe cantaloupe, make this a good one. You can sense a bit of oakiness. As we switch to reds, we get new glasses, a nice touch. Cinq again refers to five grapes, in this case cabernet sauvignon, cabernet franc, merlot, pinot noir, and petit syrah. The aroma is quite sweet, like red candy but with a touch of tobacco smokiness. I say it is tart, while my two companions insist on saying sour. Okay, so how about with a rich lasagna made with hot sausage? That would work, they agree. Ha-ha, we get it, like a ménage à trois only with three wines. 41% cabernet sauvignon, 23% cabernet franc, and 31% merlot is the combo here. Funky aroma again, lots of blackberry tastes, pretty tannic: we like it! It would pair well with lamb or beef stew. I tend to like syrahs, and this is no exception. Lovely smells of black cherry and spice, tastes of red cherry, cocoa, and a touch of tobacco. I could see this with a nice pork roast. Oh, and MTK is the abbreviation for Mattituck. 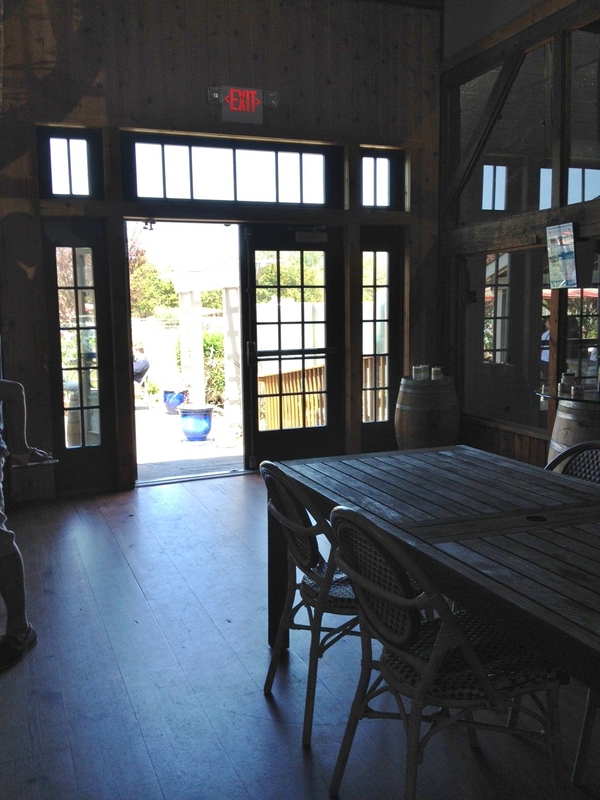 The tasting room is fine, but we wanted to be outside. A Bordeaux blend, this wine has 68% cabernet franc, 18% merlot, 14% cabernet sauvignon, 2.5% syrah, and 2.5% petit verdot—and a fruity aroma. However, it is surprisingly light, and would not stand up to a big steak. However, I like it, and compare the taste to dried cranberries, which at first surprises my companions and then they nod their heads in agreement. We manage to get the very busy server to stop for a moment and explain the name of this wine; “It’s for the name of the farmer who owns the land,” she says, before hurrying off to fill the next glass. Although it is called syrah, this is actually a blend of 62% syrah, 18% cabernet sauvignon, 9% cabernet franc, 9% merlot, and 2% petit verdot. The smell is…not good. Musty basement, I opine, and they agree. The taste is dry, of cherries, but also a tad funky. Our son likes it but wouldn’t particularly buy it. 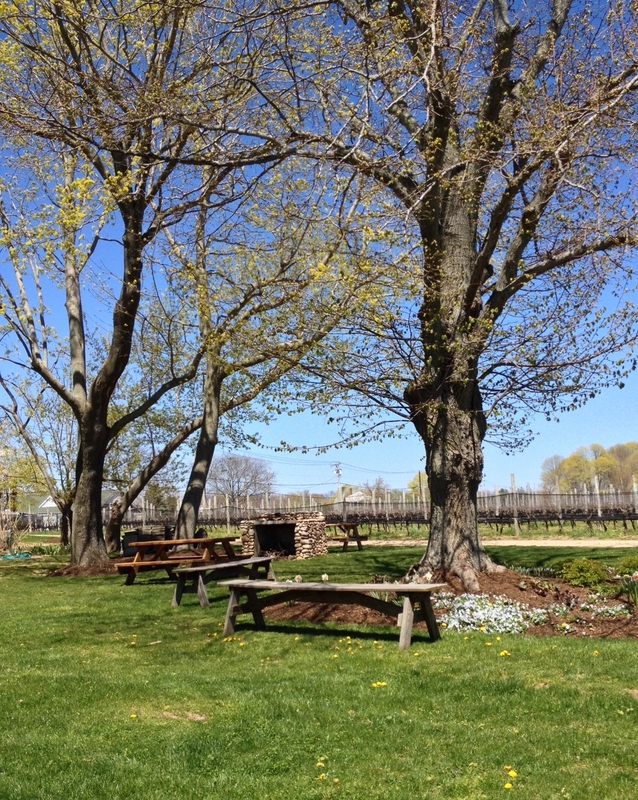 After the tasting we each get a glass—the Cinq Blanc for our son (plus he buys a bottle to take home), and the Mélange de Trois for us—and sit outside to savor the beautiful weather, the laid-back scene, the wine, the music, and the company of each other. 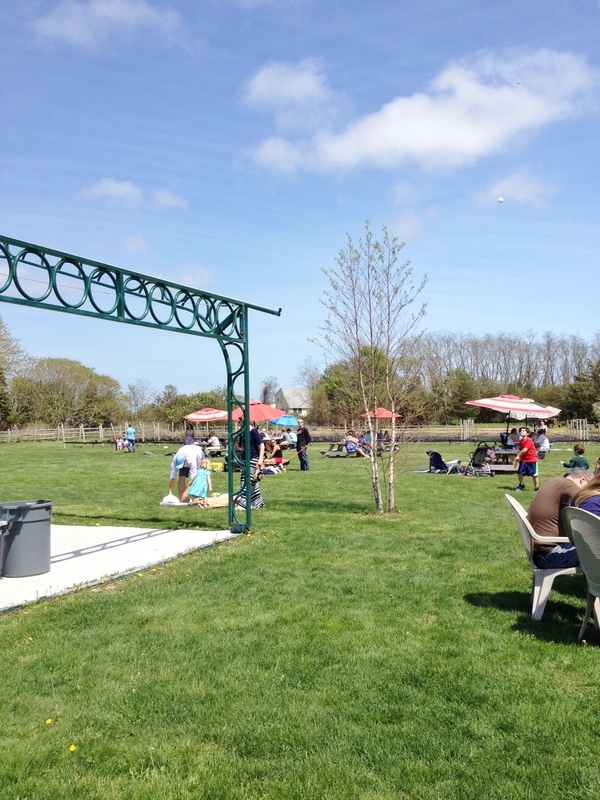 Reasons to visit: the lovely back yard area where you can bring a picnic or buy oysters or flatbreads or other snacks; the Cinq Blanc, the Reserve Sauvignon Blanc, the Mattituck Cabernet Franc, the Mélange de Trois, the MTK Syrah, the Jubilant Reserve. 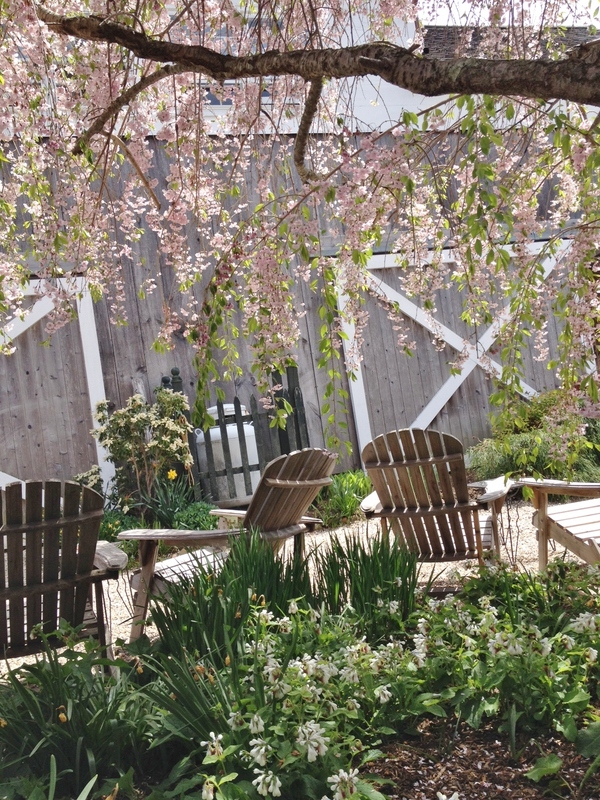 Another view of Jamesport’s expansive yard. 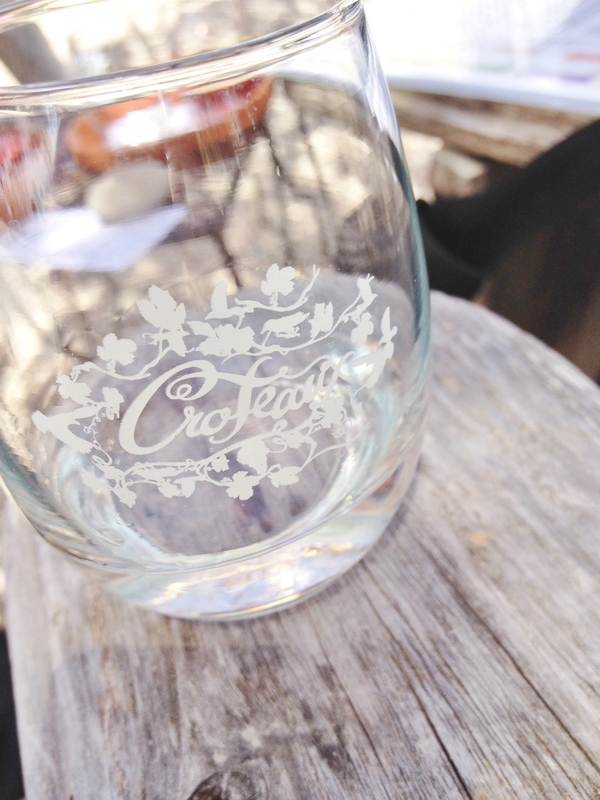 If you only do one thing, it is best if you do that one thing well, and Croteaux does. 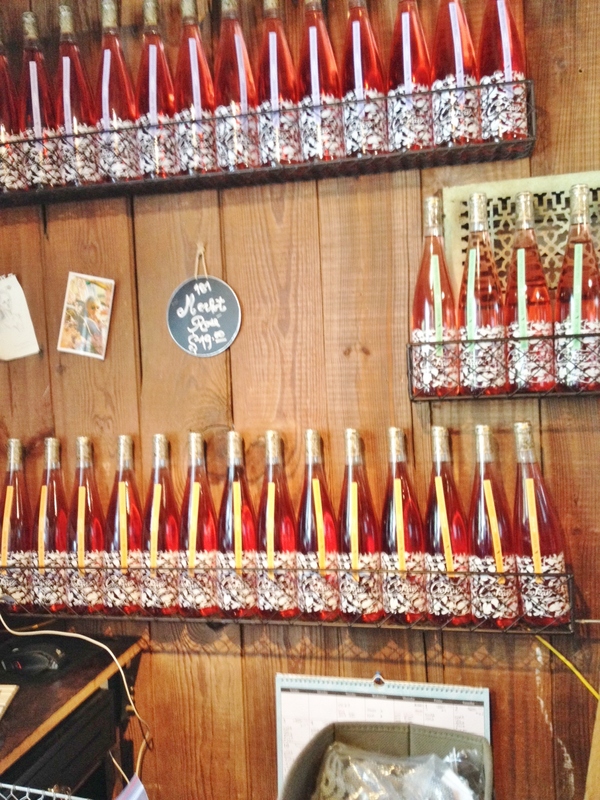 All they make is rosé, and they make the best rosés on the North Fork. 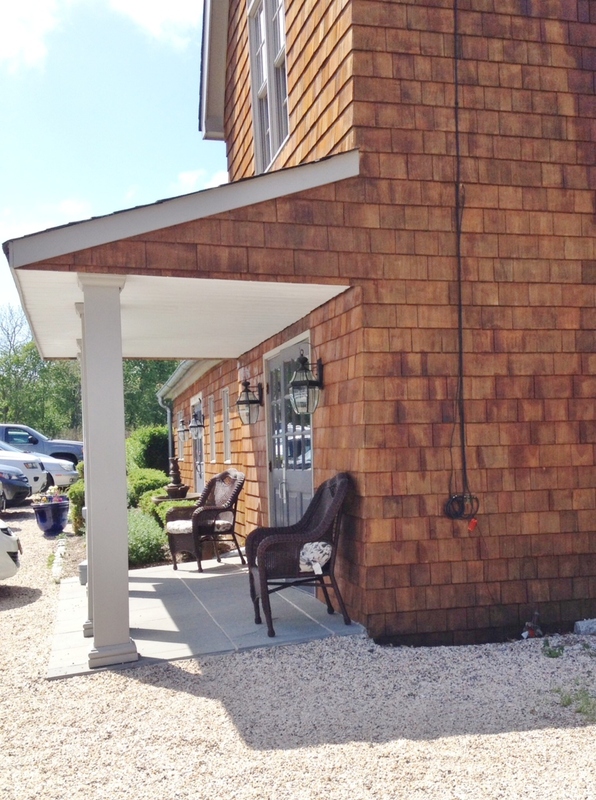 Paul and Paula Croteaux are likely to greet you as you walk through the small entry area and out into the lovely outdoor yard, where you are seated by a cheery hostess in one of the flowing tops they also sell in the charming boutique. 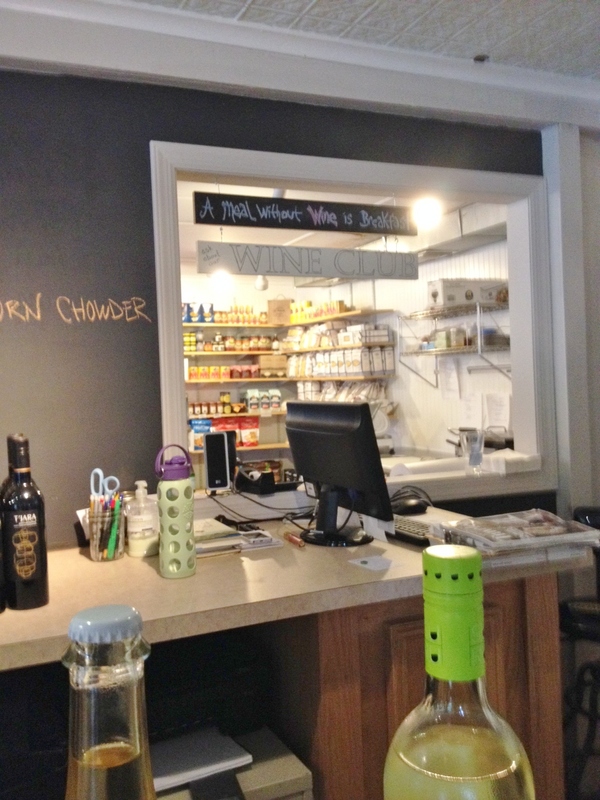 Paul, slim and gray-haired, is often behind the bar, setting up tastings, while Paula, blonde and round-faced, operates the cash register and circulates throughout the yard to be sure all is going well. It is. 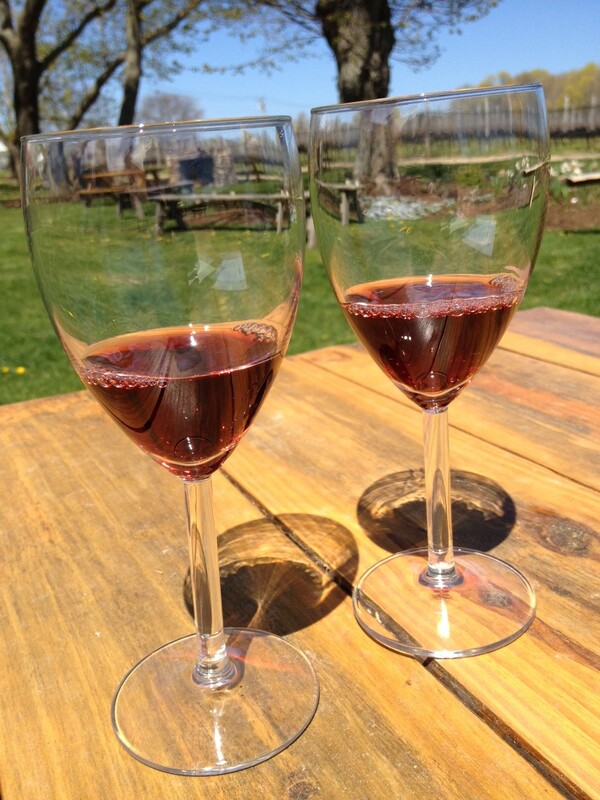 We have settled into comfortable Adirondack chairs, perused the menu, and decided we will each get a tasting of their six rosés (for $15). 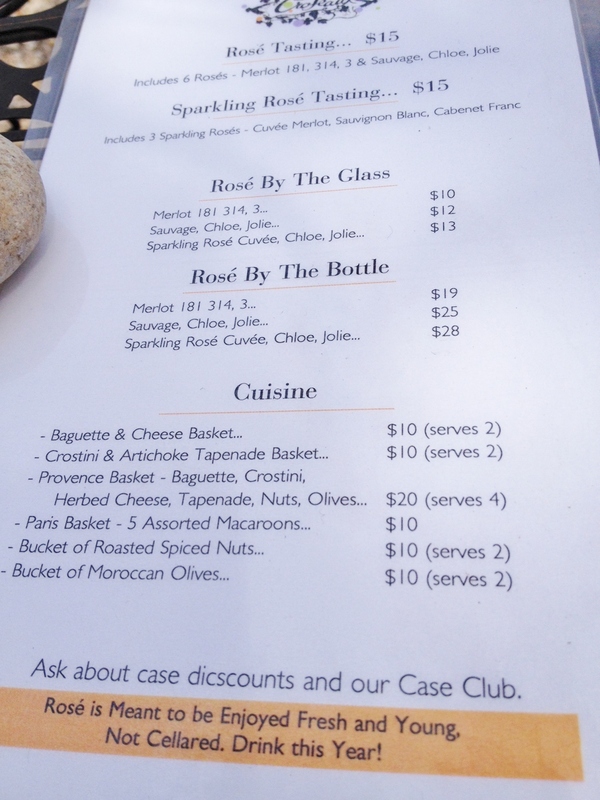 We could also have opted for three sparkling rosés for the same price. Their small menu of snacks is well chosen and homemade, but we’re planning an early dinner so we decide not to this time. The atmosphere is relaxed yet lively, with small groups clustered around the tables or in pairs of chairs (no limos or drop-offs allowed). 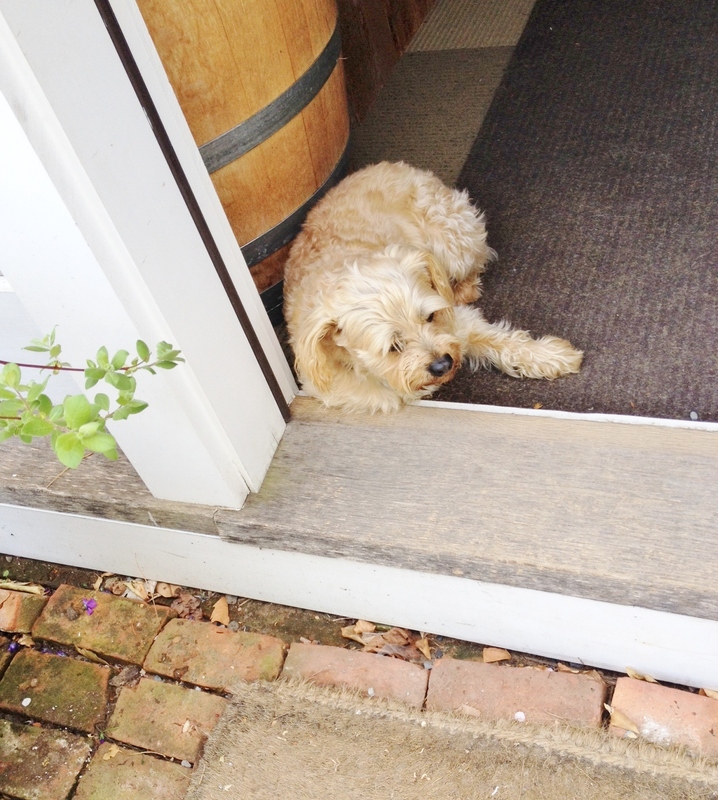 A dog enters with his humans and is carefully vetted by Sergeant, the resident little pooch. At one point the hostess brings the visiting canine a doggie dish of water—and she’ll provide humans with bottles of water as well. 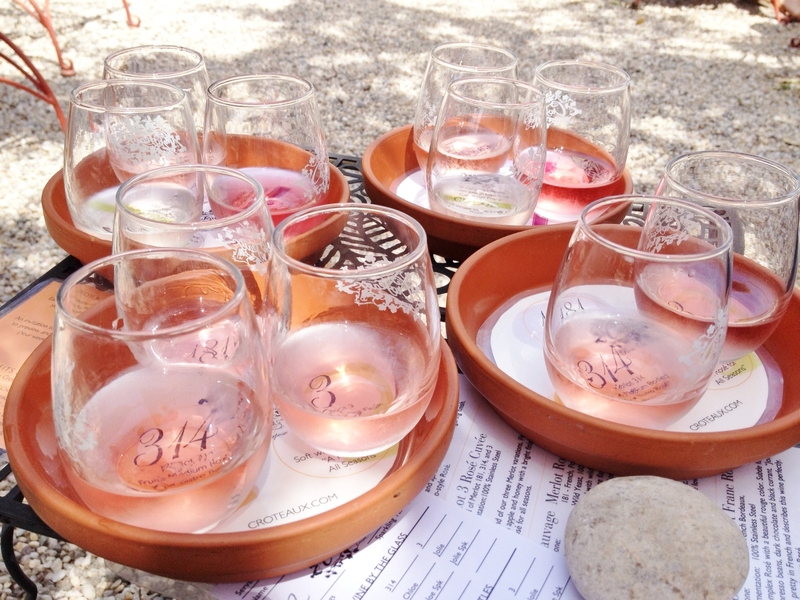 The three numbered rosé clones are each $19 per bottle, and the three named ones are $25, while the sparking rosés are $28 each. All vintages are the current year, as last year’s wines sold out! Your entire tasting is delivered to your table. A sniff reveals aromas of flowers—honeysuckle—and fruit, possibly melon. The taste is quite tart, with even a bit of a tingle, and reminds me of pink grapefruit with a touch of minerality. At the end I get lemon. This, I say, would go well with goat cheese, like the one we picked up at Catapano this morning. In the past this has been our favorite, so we have our fingers crossed that it is as good this year. Yum! Happy taste buds. We smell strawberries and tangerines, taste apricot. Though the wine has lots of fruit, it is not sweet. “This would go with most everything,” opines my husband. We plan to buy a case. A blend of three clones—181, 314, and 3—this is also a good wine, though we still prefer the 314. It is a touch sweeter than the others, though still dry, with good fruit and also a fair amount of mineral taste and some saltiness. My tasting buddy says it is “not as bright” as the 314. Now we’ve moved on to the slightly more expensive wines. Sauvage is also made from the 181 clone, but with wild yeast, which means the winemaker has given up a bit of control. The aroma reminds us of asparagus—which we also picked up this morning and plan to grill later—and the taste is quite different from the 181, though still quite good. It has more minerality and is quite light. We like it better than the 2014 Sauvage. You can see that Chloe is so light that it looks like a white wine. This is “the white wine lover’s rosé,” suggest the tasting notes. 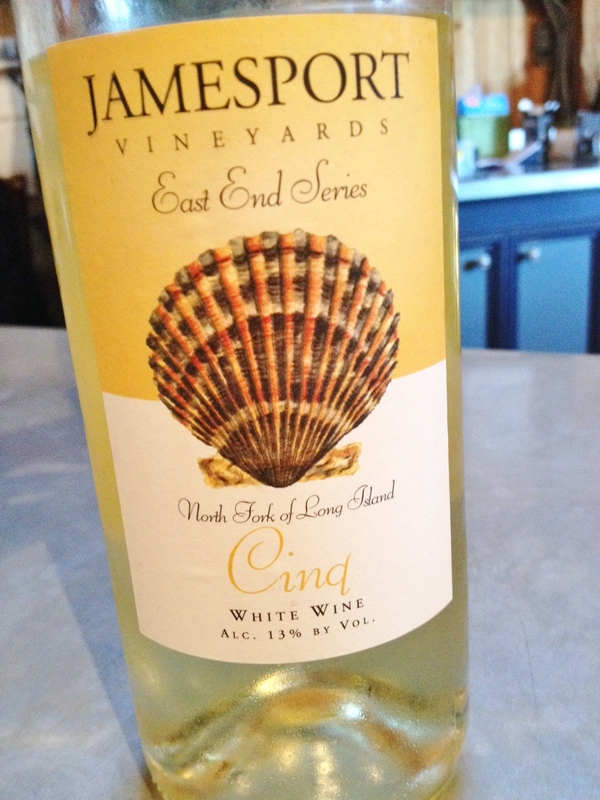 Made from sauvignon blanc grapes that spend a short amount of time on the skins, this is so pale that it looks white. We smell lemon/lime and wet ferns. The taste is quite tart and lemony, which would make it a perfect foil for oysters (No, we’re not having any of those tonight!). 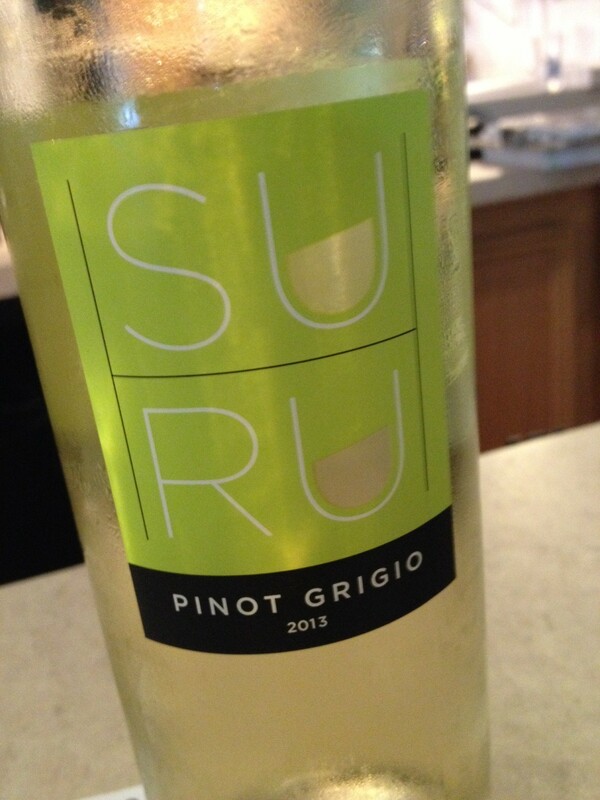 It is a touch less crisp than the usual sauvignon blanc. Jolie, on the other hand, is much darker than the other roses. So if Chloe is the white wine lover’s rosé, this is “the red wine lover’s rosé,” made from the cabernet franc grape in the Bordeaux style. Strawberry rhubarb pie aroma—just like the pie we got at Briermere this morning—and some strawberry taste, as well as a touch of espresso at the end and maybe red blackberries. Yet it is still tart, though fruitier than the others. Maybe it would go with the lamb steaks we bought at Eight Hands Farm today (new place—they sell pastured lamb, pork, and chicken, plus more). They also have the prettiest bottles. 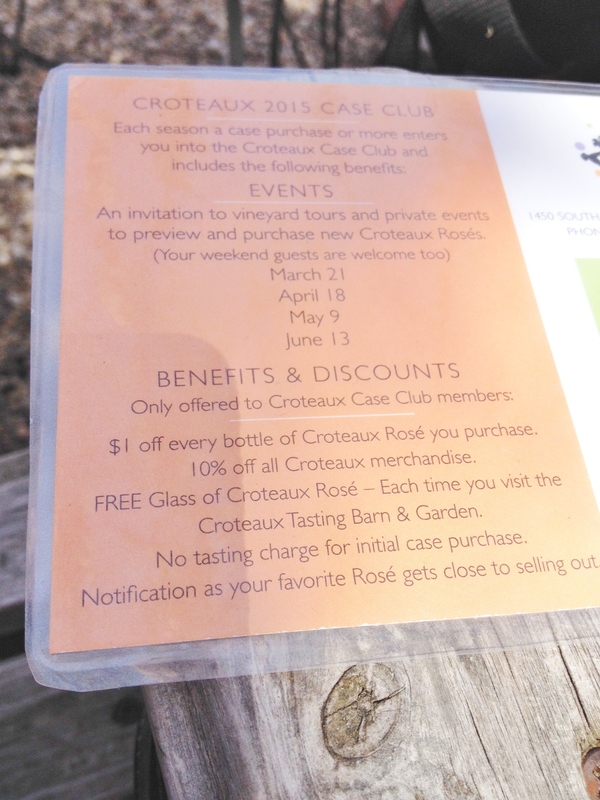 Reasons to visit: rosés that will make you fall in love with them, even if you thought you didn’t like rosés; a comfortable, pleasant outdoor tasting area; good snacks; the case club!—buy a case and you’re in the club, your first tasting is free, and you can get a free glass of wine every time you stop into the winery, plus discounts and other benefits. Pretty setting for pretty wines. 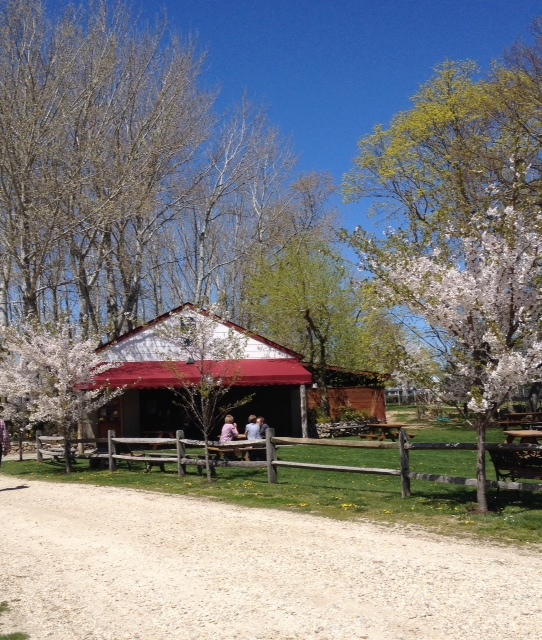 It was a beautiful spring day, so we opted to sit at a picnic table in the sunny yard outside McCall’s tasting barn (and it is a barn, with the horse stalls converted to seating areas) for our tasting. In the past, we had really liked their wines, especially the reds, so we opted to share two tastings, one of their whites and another of their Estate reds. 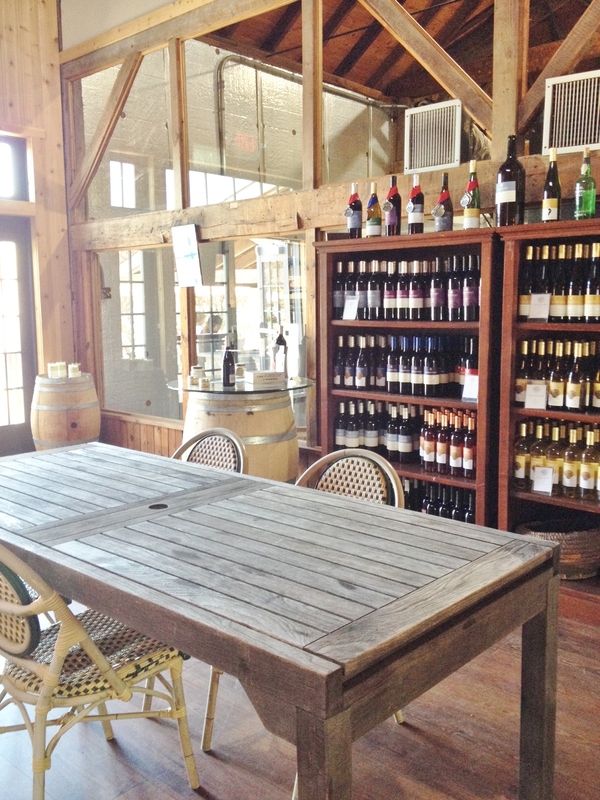 We hadn’t been to McCall’s since the summer of 2013, and this visit confirmed what we’ve often thought—that you need to taste each vintage to know whether or not you like a particular wine. In this case, we were less impressed than we have been in the past. The tasting menu offers four options of combinations which let you taste their twelve wines. Each flight offers four two-ounce tastes: White Flight for $12, Cellar Master for $12, Premium for $14, and Estate for $16. As we sipped, we watched children run around picking dandelions and other groups snack on picnics they had brought with them. Our server was friendly and efficient, and if there were any questions she couldn’t answer she quickly found out the answers for us. 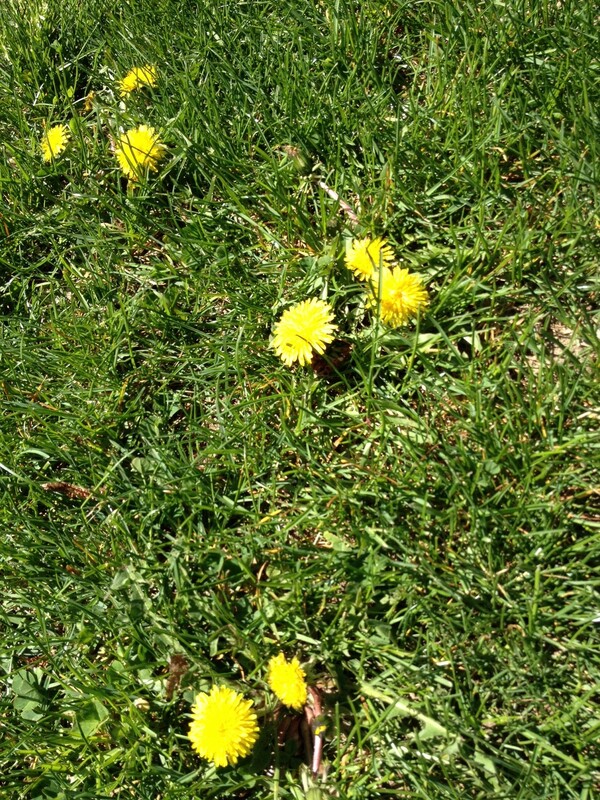 I was wondering why no one on the North Fork makes dandelion wine. I’ll start with the White Flight. Okay, so a rosé is not exactly a white, but it’s not a bad way to start a white flight. 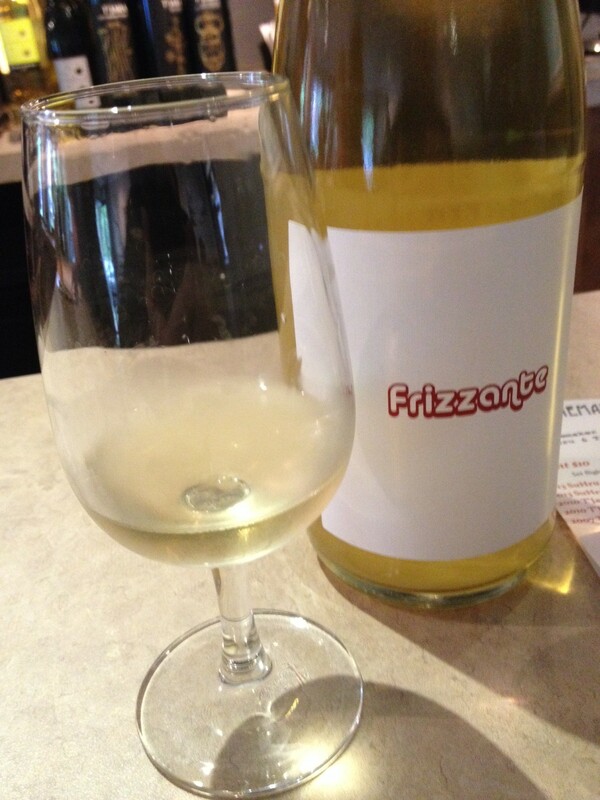 This wine is named for the owner’s mother, and is a very light-colored wine. Instead of the expected aroma of strawberries, we smelled rising dough, more like a champagne. 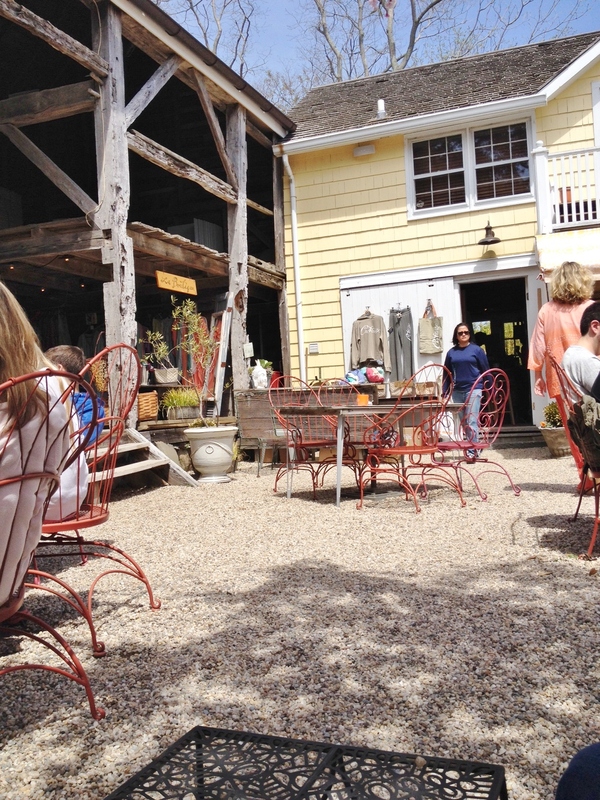 The taste was tart and lightly citrusy—“a summer wine,” noted our server. The end taste was more mineral than citrus, and fairly tart. “Like a sour candy,” noted my tasting buddy. Though it was not unpleasant, it was just okay. “This is our steel-fermented chardonnay,” said our server, adding, “and another good summer wine.” Indeed, it is fairly light and citrusy, with again a doughy aroma. Had it undergone malo-lactic fermentation? She wasn’t sure. We guessed yes. She returned to tell us that indeed it had. We decided the taste reminded us of the key lime pie my husband had enjoyed the night before at A Lure. I’m not a fan of key lime pie. McCall’s doesn’t grow sauvignon blanc grapes, so this wine is made from grapes from One Woman’s vineyard, and this was the first time McCall’s offered this wine. Good decision, as this is their best white. The aroma and taste both remind me of apricots—sort of like apricot fruit leather, with some spice and citrus notes at the end. It would be good with blue cheese or pasta in a white sauce. Sippable. No surprises here—this is a typical North Fork oaked chardonnay (nine months in the barrel, we are told), with aromas of vanilla and oak and some fruit tastes as well as some vanilla. Of course, I say it would go with roast chicken. Now we move on to the Estate Flight of reds. We are not brought fresh glasses, but we do appreciate that our server has opted to give us two glasses, dividing the taste between us rather than having us share one glass, as we generally do. I should also note that many of their bottles use twist off caps rather than corks. The setting feels quite bucolic. Well, perhaps we’ll like this one better. It spends about 3-4 weeks longer on the vine and three months longer in the barrel. Okay, definitely better. Again a blueberry pie aroma (Which reminds us that tonight we’ll be having a blueberry crunch pie from Briermere.) with a touch of cocoa. The taste has more fruit and more subtlety, but no depth and a fair amount of tartness. Again, we’re not loving it. 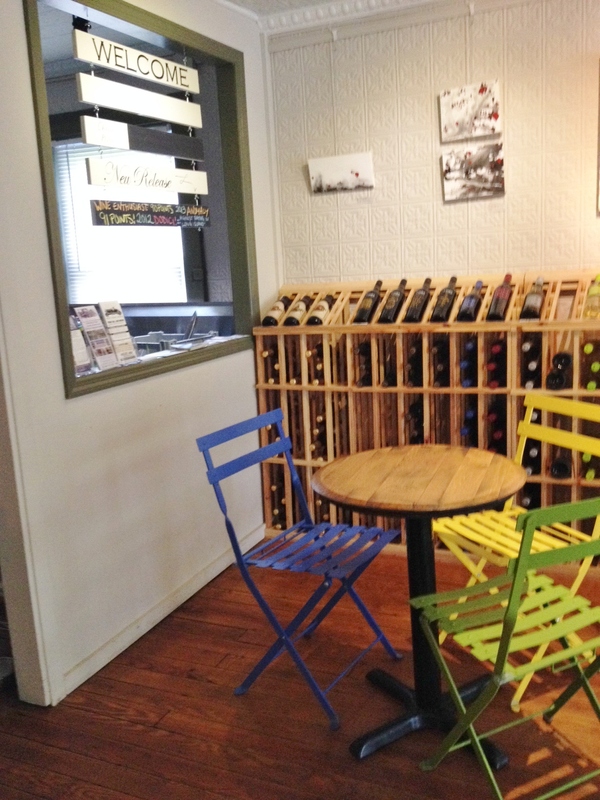 Also, the reds are all too cold, though that may not be anyone’s fault, as the tasting room is quite chilly. Nice aroma—plums, some oak—but with a touch of something metallic. This wine comes from 30-year-old vines, our server tells us proudly, from a vineyard originally planted by the Gristina family says our server (Does she mean Galluccio? 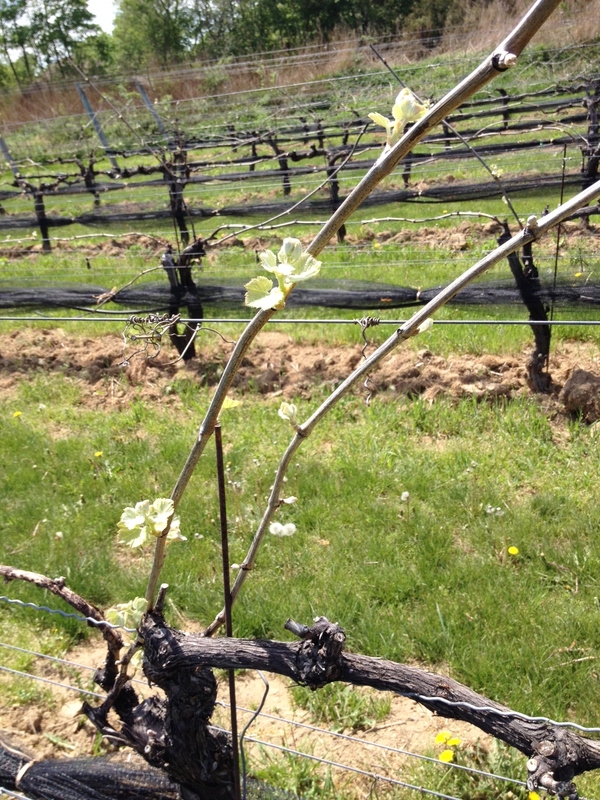 ), and though the property is now owned by Macari, McCall’s is using the grapes. Again, this wine is tarter than one would expect, without enough fruit to balance the dryness. And though our server enthuses that she really likes this one, we are not pleased with it, especially with the aftertaste. Finally, a wine we can like. This is their Bordeaux blend (named for their previous winemaker, who died much too young), though the combination is quite different from the last time we sampled it. This one is 46% cabernet franc, 25% cabernet sauvignon, and 29% merlot, whereas the 07 Ben’s Blend was 60% merlot and also included some petit verdot. In any event, we scent aromas of dark fruit, such as purple plums, and taste pleasant fruit, though it is not tannic enough to stand up to a steak. It would be good with brie and pears. 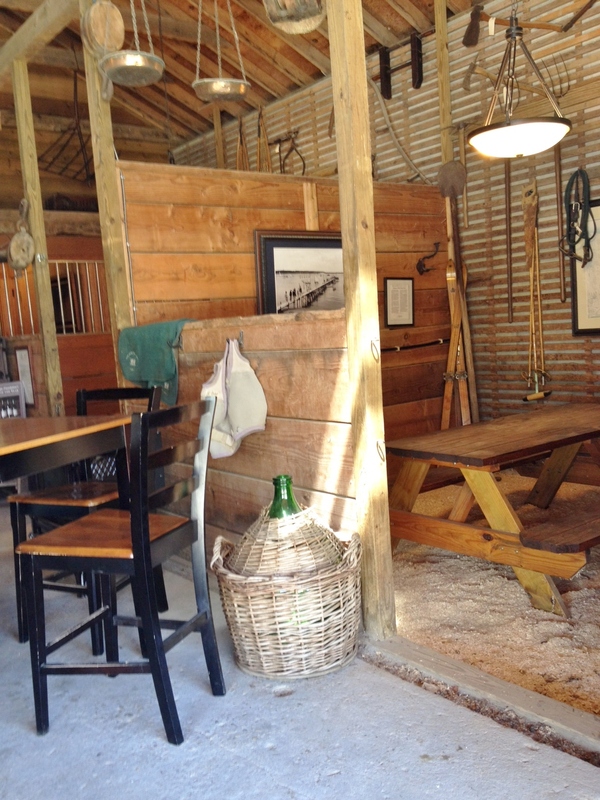 Reasons to visit: the Cuvée Nicola Sauvignon Blanc, the 2010 Ben’s Blend; a pleasant relaxed setting where kids can run around and you can bring a picnic; the surprisingly elegant rest room (!). We’ll be back when it is time for a new vintage, hoping the wines are better then, since we really liked them in the past. 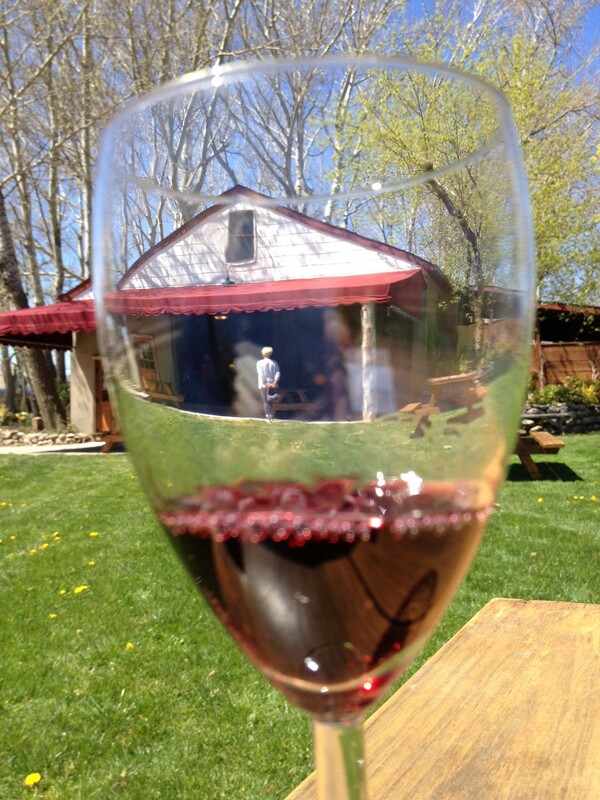 The tasting barn viewed through a taste.